Nickelodeon can sometimes surprise us with their animation offerings. Avatar: The Last Airbender appeared in 2005 as a complete surprise. This was a fusion of anime and American episodic action. The series was a major stretch for a channel that seemed comfortable with endless reruns of SpongeBob SquarePants and Fairly Odd Parents. Here was a major storyline that wasn’t fitting into 11 minute slots. The series became a sensation over the course of three seasons with its depiction of a magical world with true life conflicts. Avatar: The Last Airbender: The Complete Series gathers together all 61 episodes which is great since it’s hard to watch them in proper order when they run on the various Nick channels. In an alternate universe, the world is divided up in various ways including those people with the magical ability to control the elements. Earth benders and water benders live in fear of the fire benders that are making a grab to control the globe. What about the air benders? Those people have been rumored to have been wiped out by the fire benders. This is not good since the only person who can restore peace to the world is the Avatar. They have the ability to control all four elements. There’s only one of them alive at anytime. Except at this time, nobody can find the person until Katara, a water bender, frees a boy from an ice tomb. Ang turns out to be more than a human Popsicle. He’s the Avatar although he mostly is in tune with his air bending skills. 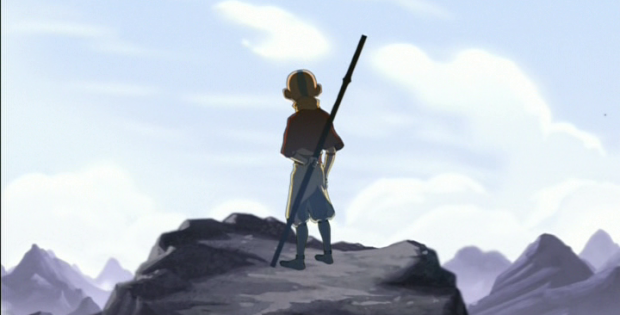 This puts him on a double journey to battle the fire benders and relearn how to bend the other three elements. It’s an amazing journey as he encounters friends he knew before the 100 year nap. The animation brings out the action and environments of the other worldly land. The video is 1.33:1 full frame. The DVDs are pretty much the original versions repackaged. This means the video resolution isn’t quite up to HD levels. This is a series that deserves a Blu-ray transfer at some point so it can look as good as The Legend of Korra. He if you haven’t bought the DVDs, this is good for now. The audio is Dolby Digital 2.0. The mix is fine for the level of action and dialogue. Bonus features are the ones from the original individual season releases. There’s plenty of commentary tracks. There’s also quite a few features explaining how the animation was created. Avatar: The Last Airbender: The Complete Series remains a great achievement in animation from Nickelodeon. It’s so much better to watch than the live action version directed by M. Night Shyamalan. Nickelodeon and Paramount Home Video present Avatar: The Last Airbender: The Complete Series. Starring: Zach Tyler Eisen, Mae Whitman, Jack DeSena and Jessie Flower. Boxset Contents: 61 Episodes on 16 DVDs. Released: October 6, 2015.